The AquaBound Sting Ray Hybrid Posi-Lok paddle is designed to provide superior performance, a low swing weight, at an economical price by combining a carbon shaft with fiberglass aBX II blades. The Aqua Bound Sting Ray is a lightweight, all-purpose paddle with a blade shape that is silky smooth through the water. The carbon shaft gives this paddle an incredibly low swing weight and is unbeatable at this price! Features the Posi-Lok ferrule system. Posi-Lok is an adjustable ferrule system which allows the paddle to be feathered at several angles and makes adjustability on the fly a breeze. Left handed paddlers, or paddlers who enjoy changing the angle of the paddle to suit the conditions, will like the versatility of the Posi-Lok ferrule system. Simply pinch the dual-button release and twist to your desired feather angle. The ferrule clicks firmly into the lock position to achieve a rock solid connection with no play whatsoever. The Posi-Lok ferrule does NOT allow for changes to the length of the paddle. Ordered these on Tuesday and had them on Friday. Customer service is friendly and efficient . First time kayaking so I have nothing to compare them too. Wife and I are middle aged and paddled for 6 straight hours. She is a natural with this paddle. Out running John boats with 50 lb thrust. Should have saw the look on their faces as we effortlessly paddled right by and left them in the distance. Extremely light and fast with very little effort, and they float. Another thing I noticed ( we did look at paddles in places like Dicks and GM) These paddles are very sturdy, and snap together with little to no effort, and they feel good in our hands, not cold like the cheaper paddles. 6 hours paddling and no blisters. If your serious about kayaking, spend the extra money and get an efficient light weight paddle. I'm so glad I spent the extra money. This paddle is very good quality and is lightweight. It is every bit as good as the one that came with my Hobie kayak. I've only used it a couple of times but it works well. Aqua Bound Sting Ray Hybrid is a great light weight paddle. The Posi- Lok allows you to adjust the angle in tiny increments. Ordered the 240 length paddle. On the first trip out to the river, noticed it was super light, great paddle for all day yak fishing. Have used this paddle for 2 yrs now w/ my Perception Carolina 13.5 and very pleased with the performance and durability. I use this paddle mainly on lakes, as I'm a bit apprehensive about tearing up the blades on some rivers I travel on. Very light, gives you an enhanced feeling of control. Get a pair of Yakgrips w/ it and you will be heaven. Paddle drip rings could be a bit better as water sometimes gets past them. Breaks down (in half) for easy storage or transport in car trunk or back seat. Locking mechanism is great (thought initially that it would be an issue), and being able the change the paddle angles is a plus. 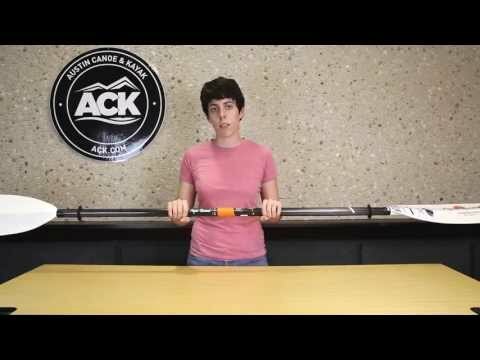 Consult w/ someone at ACK to make sure you get the right length paddle for your needs. This is a great paddle for the money. I have less shoulder and neck fatigue because its so light. It's the way to go , spend the extra money it's worth it. Great lightweight paddle!!! New to kayaking; used to be an avid canoer Went to a seminar to learn about kayaking and they stated the lighter the paddle, the less fatigue, easier to move, etc. I love this paddle and would recommend especially to a new kayaker!!! ! No fatigue and it is so light weight that you barely notice it. Bought the paddle about 8 months ago for Christmas 2013. I use it a couple times a month for fishing in the local rivers and lakes along with the occasional trip to the coast. Over all i like the paddle but on my latest trip to PINS the locking system failed. I am not sure what can be done to fix the problem but well be looking into it. Wow!!! Going from a cheap paddle to a mid price paddle made a tremendous difference. Just made a 15 mile trip down the Colorado from Utley to Bastrop and the Aqua Bound Sting Ray Hybrid really felt good from start to finish. Carbon shaft is light and comfortable in your hands. 5 Stars for quality, looks, durability and comfort. Paddle is light-weight, durable, and easily adjustable. It locks into place and stays locked, even through shallow rocky areas when pushing off repeatedly. Great value when bought with the Wilderness Systems Pungo 14' kayak! Fantastic product!! Has the feel of a $200 paddle. It is extremely durable as well. I'm able to push off the bottom, rocks, boat docks, etc. and not worry about the paddle being damaged. I ordered 240cm for my 12' fishing kayak. I'm 6' with long arms and it's the perfect length. Thank you ACK for a fantastic value! Great paddle. I love the feel in the hands and action in the water. It has an awesome, natural grip to it in the carbon fiber design. It's amazing what just a few more $$ will do compared to my original paddle. The Posi-Lok works great. This paddle is so light and I don't have excessive fatigue. It's also easy to use. Love it!! 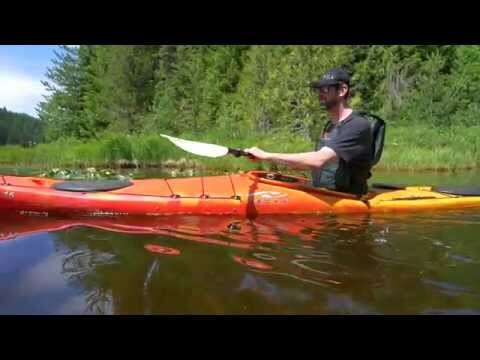 Wonderful light weight kayak paddle. I LOVE it! My only issue is that it doesnt fit snugly on the side of my Hobie Sport. I still would highly recommend this paddle to kayak enthusiasts. Enjoy Life! I came from a $15 kayak paddle to this and let me tell you, this is an awesome paddle. I have only been able to get out with it a handful of times but I can already tell it how nice it is. The quality build on it is awesome. The TLC and feathering is beautiful and it is super light. I can't get over how light it is. I love it so far. Q: Do you have the stingray hybrid and/or the stingray carnon in the small shaft also? A: We do not carry this in stock, but we can special order this option for you through Aquabound. Q: Does this paddle come with the Drip Rings?